When people start talking about destiny my natural reaction is to roll my eyeballs, stifle a yawn and start formulating an exit plan – discussions on the healing powers of crystal have the same effect. So it’s strange that this season I put aside all my natural instincts and genuinely started to believe in destiny. This seemed impossible in July. The death of Phil Walsh changed everything. It put football in its place and reminded us of far more important things. This family tragedy was felt around the nation. In Adelaide it hit particularly hard. Back to football, no one knew how it would affect the players. And no one expected them to play finals. They rightly won accolades, and respect, for turning up and playing just eight days after Walsh’s death. It all seemed so improbable walking into the MCG, just two months later, emboldened by a sense of destiny – walking tall, glowing with pride and imbued with quiet confidence. The pulsating win over the Bulldogs that night fuelled the sense of destiny about Adelaide’s season. It was a modern day classic. I smiled, danced and laughed my way through the week. I waxed lyrical about the importance of a small, predatory and dangerous forward to my two-and-a-half-year old son. The feeling of something special brewing was contagious. As fans we sign up for the ride. We start the season fully aware of the exhausting rollercoaster that awaits us. We know we will win some matches we should have lost – we know we will lose some matches we should have won – we will shout ourselves hoarse celebrating and berate holding the ball decisions (and non-decisions). We will gloat and some weeks we will be very quiet. This kind of devotion is intense – but when you add a sense of destiny everything is amplified. The emotional volume dial gets turned to 11. It was clear by quarter-time against Hawthorn that Adelaide’s heart-rending season was over. Resigned to this fact I drew in every last breath of 2015: Hawthorn’s immense pressure, the inability of the Crows to get their hands on the ball and Dangerfield’s miraculous snap from the boundary line. As painful as it was, I had to see it through, this year more than any other. Hashtags can be trite and meaningless but “we fly as one” summed it up beautifully – never before had I felt so connected to my tribe. Crows coach Scott Camporeale was right. It could have gone either way after the heavy loss to West Coast in round 15. Somehow the Crows mustered the strength to win six of their last nine home and away games to book a finals berth. Perhaps we started to believe it was destiny because it helped in some way to comprehend the loss of Walsh. Believing in destiny was our way of healing while honouring the man who started it all. Only now that it’s over can we exhale and appreciate the immensity of what the Adelaide Football Club achieved this season. And only now can the players grieve normally away from the bubble of football. At the supporters’ after party on Friday night the band played April Sun in Cuba to lift the mood. We all respond differently in situations like this. Never one to miss an opportunity, I sought comfort in the warm arms of Tony Modra. There was a sense of disappointment in the room. Of course there was. The Crows had just lost a semi-final and it was highly likely Dangerfield’s last game in our colours. All talk of destiny had ceased. It stopped after the first quarter – but it had been replaced by something stronger and more real. Looking back I’m glad I rode the destiny bandwagon, riding up front, clinging onto the reins, full gallop, fire in my eyes and in my belly – for a few wild weeks it made us feel so much better about life. It swelled our hearts and brought us closer. It made us feel invincible. Destiny may allow us to dream but it’s the players, through their strength, courage and resilience, who determine what is possible. We’re hard-wired not to like each other. Some AFL clubs talk about rivalry. Ours is the real thing. Uncontrived. Unabashed. We will meet you in the car park. It’s genetic. It runs deep in the blood. I inherited my dislike of all things Port Adelaide from my maternal grandfather and my duty as a Crows fan is to make sure it continues down the line with my son. This is why the coming together of the Adelaide Crows and Port Adelaide over the past two weeks to honour Phil Walsh has been so powerful. So incredibly moving. And so at odds with the natural order. I could never have imagined it. Nor could I ever have imagined the circumstances that united us. And the togetherness has felt right. Showdown 39 was always going to be different. Acrimony was replaced by harmony. Port invited all Crows supporters to join them on their March from the Mall, a ritual for all Power home games. The two sides ran out together before running through a joint banner. Both theme songs were played, followed by a special version of Port Adelaide’s anthem Never Tear Us Apart honouring Walsh’s time at both clubs. Tragedy has transcended cross-town rivalry – even for the most hardened fan. As soon as the siren sounded we reverted to type. There was no discernible softening of hostilities on the field – the attack on the ball, intensity, tackling and niggle, the ebb and flow of the game, the booing from the crowd – all classically Showdown. Along with that feeling of unrelenting tension, of another twist coming. Of being unable to relax despite the widening margin. The players gave their all. They said they would. It was the only way to honour a man they respected and loved. And boy was it a game he would have loved. The closest one ever. And when it was all over the Crows’ theme song wasn’t played. Instead, both teams gathered for the presentation of the Showdown Trophy and Showdown Medal, renamed the Phillip Walsh Medal for this one match. A minute of robust applause a final mark of respect to Walsh. Showdown 39 will stand alone in the vibrant history between these two proud South Australian clubs. There will never be another one like it. A day when bitter rivalries were put on hold and replaced by something much bigger. Some things are more important than football – a sentiment captured beautifully by opposing chairmen, Rob Chapman and David Koch, who watched the final minutes of the game, arms locked, tears in their eyes. So to both clubs, thank you for allowing us to grieve as one. I hope in some small way it has given comfort to the Walsh family, and eased some of the pain for the players and club people who had a connection to Phil Walsh. Fans of the Crows and Port will go back to doing what they do so spectacularly well – feeding the antagonism with taunts and insults, some of it light-hearted, some of it venomous. But pausing the fierce rivalry was the right thing to do. And it was strangely beautiful while it lasted. Never in the history of combat sports have women been presented as the main and co-main event. This is set to change when the Ultimate Fighting Championship juggernaut comes to Melbourne in November. Ronda Rousey fights Holly Holm and Joanna Jedrzejczyk takes on Valerie Letourneau in the strawweight division. But make no mistake, the elevation to headline act is the work of one woman: Olympic judo medallist turned mixed martial artist, Rousey. She is – to use fighting parlance – ‘the baddest woman on the planet’, and I can’t help but be drawn to her. I like the way she shoots from the hip – words pour out of her mouth in rapid, machine gun fire sentences. She has no filter. And she clearly has no fear – she doesn’t turn meekly to her PR agent, she doesn’t dodge questions, she doesn’t relentlessly tow the corporate line and she doesn’t want to please everybody. All the time. She is her own woman – flaws and all. And this makes her fascinating. She is the reason I take an interest in the sport. Ten years ago if you said there would be a woman in the top five pound-for-pound fighters in the world you would have been laughed out of the room. She’s the reason women are competing in the UFC. Again, this was unthinkable 10 years ago. UFC president Dana White went as far as to say it would never happen on his watch. Rousey is now the face of the UFC. She signed with the UFC in 2011 and has successfully defended her bantamweight championship six times. She holds the record for the fastest championship stoppage in UFC history – 14 seconds. She remains unbeaten (with a 12-0 record) – and her past four wins have lasted a combined 130 seconds. Outside the octagon, Rousey wants to lift women up, not knock them down. She is vocal about issues close to her heart. As a younger athlete fighting in strict weight classes she was under constant pressure to make weight. This relentless struggle led to an obsession with body image, which resulted in bulimia. Her message now is simple and powerful – it’s okay to have a muscular body. It doesn’t make you less of a woman. Or in her words, “I think it’s femininely badass as f**k”. She prefers to be photographed before she has cut weight for a fight – it’s a truer reflection of how she looks. She was one of the few big stars to repeatedly (and loudly) speak out about Floyd Mayweather’s history of domestic violence. When she won the ESPY Sportsperson of the Year award this year (Mayweather was also in contention), she asked Mayweather how it felt to “be beaten by a woman for once”. Rousey also isn’t afraid to criticise ‘role models’ like Kim Kardashian who she believes is famous for the wrong reasons and sets a bad example for teenage girls. All this makes her one of the world’s most compelling athletes. Her name has entered into popular culture – and her reach ensures her messages are being heard. Rousey herself is a reluctant role model. She would rather girls be their own super-heroines. If a drop of what Rousey says breaks down barriers and changes attitudes then surely that is a good thing? She may not be everyone’s cup of tea but right now she’s hard to ignore. I think it’s terrific that she isn’t afraid to pick a fight outside of the ring. As she matures it’ll be interesting to see which path she takes – fame can either eat you up or propel you onto a greater stage. It might be wishful thinking but I would love her to use her power and influence to address the broader issues of equality, respect and recognition for women in sport. She has shown, when she’s passionate about something, she can make a difference. Sport needs women to blaze a trail – no matter how “badass” they are. The death of Adelaide coach Phil Walsh is a senseless tragedy that has shocked the nation. 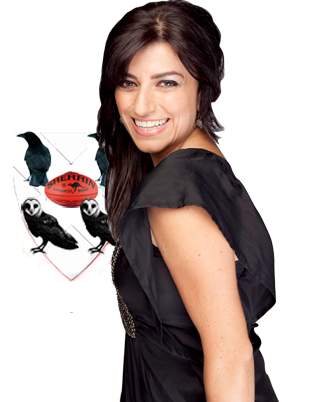 Crows supporter Angela Pippos says time is the only thing that will heal the club. Some things in life are just so awful. We often have the fallback of rationale and empathy but right now they don’t cut it. The only thing we have in a moment like this is time. Let time do its thing because right now nothing else makes sense. It is impossible to imagine how those closest to Phil Walsh are feeling, his wife, his family, his friends and his players. As we struggle with our feelings the game itself becomes irrelevant but the sense of shared loss does not. The football family will come together. And that will mean different things to different people – and no matter how cynical you feel about public mourning, the show of love and support, of the laying down of flowers and scarves – these actions will resonate on some level and will help many of us fans feel just a tiny bit better. The city of Adelaide will be hit very, very hard with this tragic news. The town moves to the beat of the Crows – in cafes, homes, by the beach, in workplaces and sporting clubs there will be only one conversation. My heart goes out to the young Crows fans with posters on their walls and signed jumpers – it’s hard enough for adults to comprehend let alone children. We were just getting to know Phil Walsh. And we liked what we saw. A very human coach, tough but fair, devoid of the prickly self-importance that often comes with the territory. A breath of fresh air. It felt like he had let us in – given us a peek at the man behind the tracksuit. Warts and all. He came across as passionate and genuine, and armed with a healthy dose of self-deprecation. He crossed the great sporting divide. The pause button has been pressed on the bitter rivalry between the Crows and Port Adelaide. All the talk of the game against Geelong, of Dangerfield staying or going, of win/loss ratios, of finals, it all feels meaningless and separate from what really matters – the feelings that make us human. It reminds us of just how deeply we are able to feel, to be affected, to be shocked and saddened – and how precious we all are. In time the game will become the game again and it will be about things like efficiency in the forward 50 and uncontested possessions and I’ll resume shouting at the action – punching the air when Eddie Betts produces something magical and doing a crazed jig with my son when the final siren blows. All the plots and subplots of the game will soon resume their relevance but the season, now past its half way mark, feels shadowed in grief. And these shadows will stay with us for quite some time. So you’re proud of the Matildas’ performance at the World Cup … now what are you going to do about it? So you’ve enjoyed watching the Matildas at the World Cup. You’ve seen how exciting women’s football is. You feel proud, deeply proud of what the Australian team has achieved over the past three weeks. You’ve watched them tame the “group of death”, take it right up to the USA, defeat Nigeria and draw with Sweden. You’ve cheered them through to the round of 16, gone into orbit after the win over Brazil (the first win by an Australian senior football team in a World Cup knockout game), and flung yourself out of bed on a Sunday morning to see them take on defending champions Japan in a quarter-final. It’s not enough to say you’re proud. We’re all proud but we have to do more for women’s football to grow in this country. We have to do more for the sake of our daughters. Act on how you feel about the Matildas. Start taking your daughters (and sons) to W-League games. You’ve seen the potential in this national side after just six months together. Take an interest in where they’ve come from and where they developed their sublime skills. Matildas midfielder Elise Kellond-Knight is right. Imagine how good they’ll be in another four years? Get noisy about the lack of coverage of women’s football in this country. For a sport to prosper it has to be visible. Sadly, the ABC decided to stop broadcasting the W-League after the most recent round of federal budget cuts. Once again women’s sport is the sacrificial lamb. Call out sexism when you hear it. It usually contains one or all of the following – women’s sport is boring, women athletes aren’t strong enough, skilful enough, fast enough or entertaining enough. The people with these views need to dust the cobwebs from their thinking and wake up to the realities of sport today. Take a look at Amy Poehler’s response to Sports Illustrated analyst Andy Benoit’s tweets about women’s sport this past week. That should get you in the mood. And stop comparing women’s sport with men’s sport. It’s such a tired, stupid, boring and pointless argument. How about we recognise and celebrate the differences between men and women’s sport instead? Both have a whole lot to offer and should be valued and respected equally. Let’s turn the Matildas bandwagon into something else. Something compelling. Something sustainable. Something that will inspire girls and give them another sporting option. Sport is about more than shiny gold medals. Sport is about creating a healthier society – both mentally and physically. Strong role models have an important role to play in achieving this. For too long sport has been defined by men and for men in Australia. The opportunities, facilities, pathways and the will to change the grossly lopsided landscape just haven’t been there. And we wonder why girls drop out of sport in their teenage years? Girls deserve a clear pathway, not one with potholes and ill-informed attitudes. It’s not a pipedream. Last November a record crowd of 46,000 turned out at Wembley to watch the English women’s football team take on Germany in a friendly. Momentum from the London Olympics played a large part in making this happen. There’s been a shift in the national consciousness. Their women footballers and cricketers are seen in a new light – they command new respect and they’re building a new audience. It’s not surprising the Lionesses have made it through to their first World Cup semi-final. There’s no reason why a shift in the national consciousness can’t happen here. But a spike in interest every four years won’t do it. The possibility of a woman playing in the AFL was raised by Jeff Kennett some six years ago. But Angela Pippos feels the idea is misguided. Spectacular marks, bone crunching tackles and clever goals are all part of women’s football – so too is spirited debate about the best way forward for the burgeoning sport. The third exhibition match between Melbourne and the Western Bulldogs at the MCG last week sparked a new round of discussions with some opinion-makers running with the “if they’re good enough they should compete with men” line. This might be well meaning but it misses the point and a golden opportunity for change. The idea that, to have equality in sport, women must compete with men bothers me. It’s a tired argument that brings to mind the gold-coated rickshaw that carried Bobby Riggs onto court against Billie Jean King in the “Battle of the Sexes”. Like the sauna exercise suit, that thinking should stay in the 1970s. Forty years later people are still suggesting equality is best served by throwing men and women together in the same field of play. Because, that’s the only way to demonstrate how good women are as athletes. Or so the argument goes. Why should men be the measuring stick of greatness? As a starting point how about we just stop comparing men and women. It’s time to come to terms with the fact men and women are different. We are wonderfully different and this is a good thing that should be embraced and celebrated. We should be striving to create meaningful and lasting sporting competitions women can flourish in. Let women play by themselves. That’s what the AFL is working towards with its push for a national women’s competition, which it hopes to introduce in 2017. In his address to the AFL’s annual women’s industry lunch, CEO Gillon McLachlan was bullish about the League’s plans. “The national women’s league is inevitable,” he said. Not everyone shares the AFL’s vision. Some observers say women are being “shunted into a lesser league” without access to all the spoils of the men’s competition. Perhaps my glass is half full, but we should be bolder than that. Playing sport with men will not take women to the Promised Land. Absorbing women into the (predominantly male) picture is not the answer to decades of inequality in sport. Female participation in Australian rules has tripled in the last five years. Women and girls now represent 19 per cent of all players. Last year the sport attracted 195,000 female participants in school and community-based competitions around the country, 27,300 girls to Auskick and 100 new female teams. If “they’re good enough” let these women play on their own stage where they can shine independently of men. Where they can become household names, make a decent living, win premierships, win best and fairest awards and build friendships for life. Surely it’s better to establish a successful women’s league, one that aspires to have rusted on sponsors and lucrative broadcast deals. This will be a more meaningful measure of true equality. Only a women’s competition can create a clear pathway for girls who want to play football at the elite level. This is the way to unearth and foster role models, the kind of strong, independent and healthy role models society is crying out for. Girls can play Australian rules with boys up to the age of 14 but AFL Victoria says the message from girls is loud and clear. “We are responding to the needs of the girls and they want an all-female environment”, says Chyloe Kurdas, AFL Victoria’s Female Development Manager. Some sports lend themselves to mutual participation, and I’m all for it in motorsport and horse racing. The push for equality in tennis has been a sustained effort. King set up the Women’s Tennis Association and campaigned for equal pay. She was a pioneer. Women’s sport needs pioneers and drivers of change, not fanciful notions of a one-size-fits-all approach. On this, the AFL is listening. Angela Pippos: Why are people just so rude? A clash over a communal cafe table is the tipping point after a thousand acts of discourtesy. Angela Pippos has had it with rudeness! It’s rife. I’m actually starting to think it’s contagious. Like smallpox and The Black Death. I can’t seem to get from A to B without it pulling back its lips and snarling at me, sticking its middle finger up at me, honking at me, huffing, puffing, rolling its eyes and shoulder-barging me. Rudeness is everywhere. It’s the modern disease. And I am suffering from an overload of it. Death (of the soul) by a thousand acts of discourtesy. Last Saturday was my tipping point. It was a cold day. I was out with my 17-month old son. We ducked into a cafe to grab a bite to eat and headed towards a communal table near the window. The section of the table closest to the wall was free so I politely asked if the gentleman could move his chair so we could slide in. He made no eye contact and made no effort to move. I waited. Asked again. He stood up; eyes still locked on what he was reading, and made a pathetic attempt to move his chair. There was no way the pram was going to fit through that gap. I could see this wasn’t working so I politely suggested the three of them (not Gen Y) move up so we could sit at the end closest to us. The woman could barely contain her insolence. “No”. The other man with them was suddenly very interested in looking at the end of his fork. If I had emptied the contents of a bulging nappy onto their poached eggs I would understand the hostility. But this was perplexing. Was it just because I had a toddler in a pram? I suspected that had something to do with it but didn’t stick around to find out. I was genuinely shocked. I am empathetic and, putting myself in their skin for a moment, I do understand that my request was no small undertaking. Imagine the horror of losing a whole eight seconds of reading time while making way for a mother and child, it’s preposterous – and what about the sheer physical effort required to move a coffee cup a full thirty centimetres – these are serious commitments and I haven’t even mentioned the fact that the seats next to them won’t be bottom-warmed and the salt and pepper will have to come along too and what about the long journey the plates will have to make? Seriously, this would be annoying if you were fine dining, but surely not too much to ask in a café on a bustling weekend? Why was I letting this get under my skin so much? Then I thought about it. The trouble for us all is that rude people think they are the most important people in the universe. They have their own set of rules. Their shopping trolley has right of way at all times. They have a divine right to every car space. Their conversations are so important we all must be privy to them. They think peak-hour affects them more than us. They have no empathy. The trouble with rude people is that they are everywhere. In an ideal world pram-haters, car horn-abusers, mobile phone-shouters, rubbish- droppers, queue-jumpers, fist-shakers, loud music-blasters, loud-swearers, competitive parents, public urinaters, car park-stealers and non-smilers would be rounded-up and made to live together. They would live by their own rules in a large underground cave. Far, far away. Ok, maybe that’s a little extreme – the cave can be nearby – but it has to be heavily guarded. For far too long the phrase “like a girl” has been used as an insult, and for young women it is insidious. The global push to redefine the phrase ‘like a girl’ is powerful and heart warming. Powerful because it exposes a deeply entrenched stereotype and heart warming because it shows young girls don’t conform to it. They don’t see the negative connotations associated with the phrase. ‘Like a girl’ is a badge of honour to them. They haven’t been conditioned into thinking otherwise. Yet. Narrow perceptions about girls, women and sport are difficult to shatter. This weekend another durable stereotype will be on show and beamed into tens of millions of sports-loving lounge rooms around the world. The F1 ‘grid girls’ – yes that’s their official title – will once again be on display. As the world’s best Formula One drivers prepare for the serious business of securing points in the first race of the season, the ever-smiling ‘grid girls’ will be there to serve and add glamour. That is, after all, the role of women on the grid according to Formula One boss, Bernie Ecclestone. In a letter to Renault F1 chief Cyril Abiteboul in 2013, Ecclestone said grid access passes should be used for “really glamorous ladies”. When the sun goes down over Albert Park Ecclestone’s really glamorous ladies morph into podium girls, to once again act as ornaments as the champagne flows. In the ongoing fight for equality and respect, reducing women to garnish does sport no favours whatsoever. To some this practice is not offensive in the slightest but, as a society, we need to be aware of the message it sends out. The use of women as decorations is anachronistic – no matter how well dressed they are. This year the ‘grid girls’ will be wearing crisp green and white outfits with more structure and fabric than past years but it’s not the hemline or amount of stretch in the material that’s the problem. The problem is the portrayal of women as objects, subservient to men. When it comes to presentation none are more stylish than the podium girls in world cycling. Stage after stage beautiful women in matching, tailored dresses “assist” the winners on the podium and offer a kiss, in unison, on each cheek. Like F1, cycling is hiding behind tradition. It’s time to emerge from the shadowy past. Sport is for all. The way I see it there are two options – they either start getting men to accessorise women’s sport or do away with the practice altogether. Use ambassadors from diverse backgrounds instead. I’m not wagging my finger at the women who do this – they have a choice, and an opportunity to work. But I would argue women and men are socially conditioned to perform certain roles. So is it really a choice? The onus is on the sport to evolve. The ‘Like a Girl’ campaign shows how pervasive and destructive conditioning is. In the video, men and women were asked to run, throw and fight like a girl. They responded with flailing arms and timid and feeble gestures – perpetuating the ‘like a girl’ stereotype. Pre-pubescent girls were asked to do the same and, without hesitation, they responded with strength, co-ordination and energy. The ‘Like a Girl’ campaign makes me feels optimistic about the future. It allows me to see a future where girls can aspire to become an F1 driver. Not a grid girl or podium-kisser. The Federal Government’s move to slash the ABC’s budget is a hammer blow for women’s sport. Here’s a question – can you imagine, in five years time, a sell-out crowd at the MCG watching the Australian women’s cricket team? Can you imagine that crowd in full voice cheering on Lanning, Perry and Blackwell? Some of you might be thinking there’s more chance of Clive Palmer and Jacqui Lambie eloping off to Beijing – arm in arm, whispering sweet nothings and giggling their way through customs. But it’s worth pondering. Is it possible for women’s cricket to reach such heady heights of popularity in a matter of years? Or does this thinking belong in the kingdom of the airborne pig? For women’s sport to grow you need momentum and you need visibility. The ABC’s decision to axe its coverage of the Women’s National Basketball League and soccer’s W-League at the end of the current season is not the way forward. Faced with $254 million in budget cuts it can’t have been an easy decision, but it was a decision they took. (The ABC currently shows one live WNBL game on Saturday, and a live W-League match on Sunday). There are gloomy ramifications to these actions. Women’s sport is all too often the first to go. Australian Opals superstar Lauren Jackson told Fairfax Media it was a “very dark day for women’s sport”. For basketball and soccer it’s a kick in the guts in the fight for equality. Less exposure will make it difficult for both sports to retain their sponsors if another broadcaster doesn’t come on board – it’s, sadly, the same old story. If we use performance as a measuring stick to justify coverage and investment, then the second-best women’s team in the world, the Opals (some of whom play in the WNBL) surely qualify for a leg-up? Perhaps they could have mounted a more persuasive case if they were number one? We owe it to the next generation to keep fighting for equality – or at the very least a fair go. In the past few months some eye-catching things have happened in women’s cricket. Recently crowned women’s Twenty20 cricketer of the year Meg Lanning is on target to smash records in both short formats of the game. The Southern Stars captain led the team to a 4-0 clean sweep of both the one-day and Twenty20 series against the West Indies. That was this month – in August they dished out the same treatment to Pakistan in the WT20 series. Even those who don’t follow women’s cricket have heard of Lanning and her talented accomplice Ellyse Perry. All this ‘noise’ builds profile, awareness, respect (from both sexes) and momentum. So it’s a real shame we won’t see the Southern Stars shine on the international stage until next July’s Ashes tour of England. The international summer of cricket is already over for the women before the first splash of sun block. It all boils down to a case of bad timing. The Cricket World Cup starts in January, making this a unique summer. Luck is another key ingredient needed for women’s sport to prosper. The women’s schedule was done to match the men’s T20 internationals, which were staged this month. This allowed for double-headers with guaranteed television coverage. Normally these matches are held in January. Instead the women will spend the summer playing for their respective states in the domestic WT20 competition with eight matches played as curtain raisers to the men’s Big Bash League. For those who answered ‘no it’s not possible’ to my opening question here’s something that might make you raise an eyebrow – or two. Last weekend a record crowd of nearly 46,000 turned out at Wembley to watch the English women’s football team take on Germany in a friendly. The weather, true to form, was miserable, but the passionate crowd still outnumbered the 40,000 that turned up to watch the men’s friendly between England and Norway in September. That is a remarkable (and heartwarming) fact. Despite England losing 3-0 the record number of fans never lost their voice. It was a night of triumphs. The BBC provided live television coverage and a generation of girls got to see their team as equals to the men for the first time. Momentum built from the London Olympics played a large part in making this happen. There has been a shift in the national consciousness. Women athletes are seen in a new light – they certainly command new respect and are building a new audience. In Australia in 2015-16, a Women’s Big Bash competition is due to start. Who knows what effect it will have on a younger generation of sport fans. You might even have to set off early to grab a seat.